Unless you have built a wall against all sorts of Apple® marketing, you cannot ignore that the new version of OS X® is out. The Lion has lost its mane, changed latitudes and is now a Mountain Lion! Version 10.8 of our favorite operating system comes with more than 200 new features, or so they say. This count includes many tweaks and also major enhancements. I will not review them here, as any people have done it all over the press and the “interblogs.” I have re-tweeted a number of these recent articles and you can find their links at transmug.com, in the central column, or by directly following the tweets. 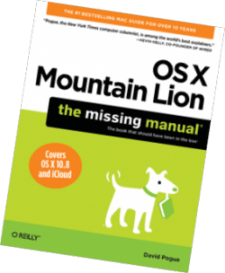 Notably tweeted, is the review by David Pogue—the famous columnist for the New York Times, “The Payout in an Apple Upgrade.” In the same breath, Pogue also released his new Missing Manual. O’Reilly, his publisher, has sent us a copy of the heavy book to raffle at our next quarterly meeting. This is not to be missed: if you have ever read Pogue’s detailed handbooks to the Mac® operating system, you know that they are chock-full of fabulous timesaving tricks, all the while offering a detailed review of all the nook and crannies of the extensive software in a clear and often humorous tone. Pogue’s article, on the other hand, weighs the pros and cons of upgrading—if you still needed convincing. True, some of your applications may not run on the new system until their developers update them, but that shouldn’t be an obstacle for most of us, most programs having been already upgraded in time. Yves posted this article under Announcements, Book Review	on Saturday, September 1st, 2012 at 12:01 pm	You can follow any responses to this entry through the RSS 2.0 feed. Both comments and pings are currently closed. Next Article → WHAT MAKES AN INTERPRETER?